The mob at the rally switched attention from Hillary Clinton and shouted "Lock her up" in response to Trump's mockery of Ford. Trump's rallies as a spectacle evoke the celebratory family atmosphere at public lynchings in America. The last lynching occurred in 1981. 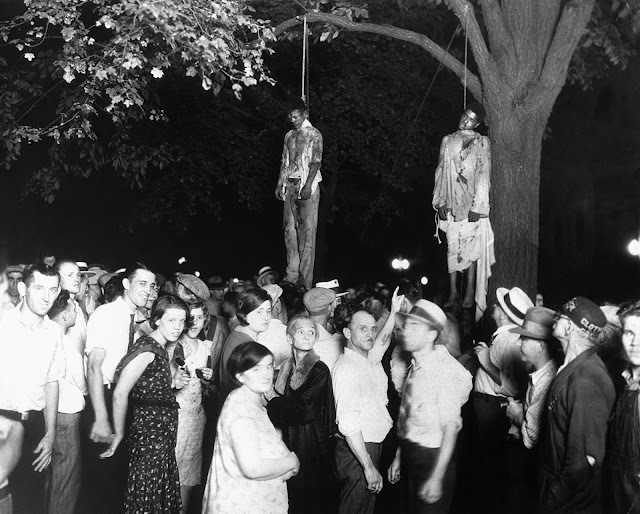 I first saw the shocking picture above of a 1930 lynching in Marion, Indiana, in a 1973 book ‘Alistair Cooke's America’ — a tie-in to Alistair Cooke's 13-part television documentary series 'America: A Personal History of the United States.' The British-born Cooke’s weekly ‘Letter from America’ programme had been broadcast on BBC Radio from 1946 until a few months before his death in 2004. In the Deep South where the lynching of African Americans was more prevalent, a mob of nearly 1,000 white people from the areas surrounding Elaine, Arkansas, in September 1919, in response to a campaign by black sharecroppers to organise a union, "began a slaughter of the black residents of Elaine, using guns, lynchings, and even burning people alive." A total of 237 blacks were murdered. According to a 2017 report "many African Americans who were never accused of any crime were tortured and murdered in front of picnicking spectators (including elected officials and prominent citizens) for bumping into a white person, or wearing their military uniforms after World War I, or not using the appropriate title when addressing a white person. People who participated in lynchings were celebrated and acted with impunity." Trump argued in Mississippi that Kavanaugh's accuser had no corroborating evidence and the White House ensured that an FBI investigation would not be allowed find it. 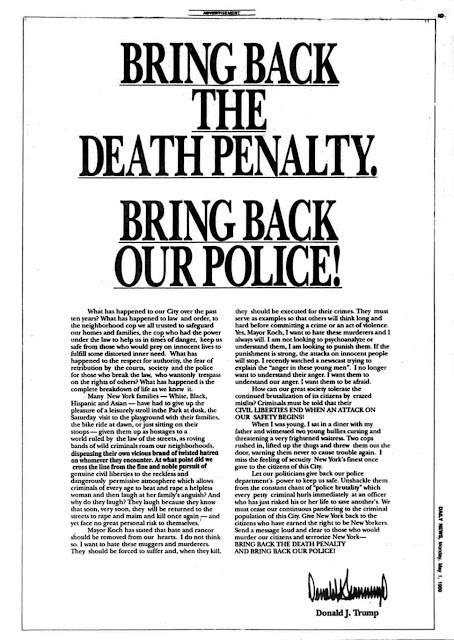 In 1989, Donald Trump in a full-page ad in 4 New York newspapers, had called for the death penalty for five Latino and black 14-16-year-old boys, for the murder of a female jogger in Central Park — they were subsequently cleared of the murder. Hecklers yell "Lock him up!" as Michael Flynn, the Irish American former 3-star General, who was leaving a courthouse in December 2017 after making a guilty plea of lying to the FB1. Trump's short-lived National Security Adviser, at the Republican National Convention in 2016, had led the crowd in chanting "Lock her up," in respect of Hillary Clinton, the Democratic Party candidate. "Is the white working class losing economic ground because of policies intended to improve the lives of black people? Anxiety and resentment among some white voters about those policies certainly seemed to benefit Donald Trump’s campaign last year, with its populist, ethno-nationalist message. The problem with this belief is that it is false. The income gap between black and white working-class Americans, like the gap between black and white Americans at every income level, remains every bit as extreme as it was five decades ago. (This is also true of the income gap between Hispanic and white Americans.)"